Since its inception Skitter has been a fantastic tool for character review and retention. The blank canvas of each writing prompt is a wonderful execution of the active recall principle–stimulating memory recall during the character writing process. But what happens when something new appears on Skritter for the first time? Using the “show” button presents the character in question, but it will disappear as soon as you start writing it. Holding down “show” reveals the stroke order, but the interaction isn’t the most intuitive, and it still forces you to recall the character from memory. Not an easy task for something you might be encountering for the first time in a list. Ever since building the first Android beta, the Skritter team has been wanting to make character teaching a larger goal of our application, and that goal is quickly becoming a reality on “Skritter 2.0,” the working name of Skritter’s new html5 client. In addition to updating the look and feel of Skritter’s website and mobile applications, we’re also working on bring a better learning experience to Skritter, and we’re kicking it off with our new teaching mode! Teaching mode will be the default behavior for any new items that appear on the beta site. 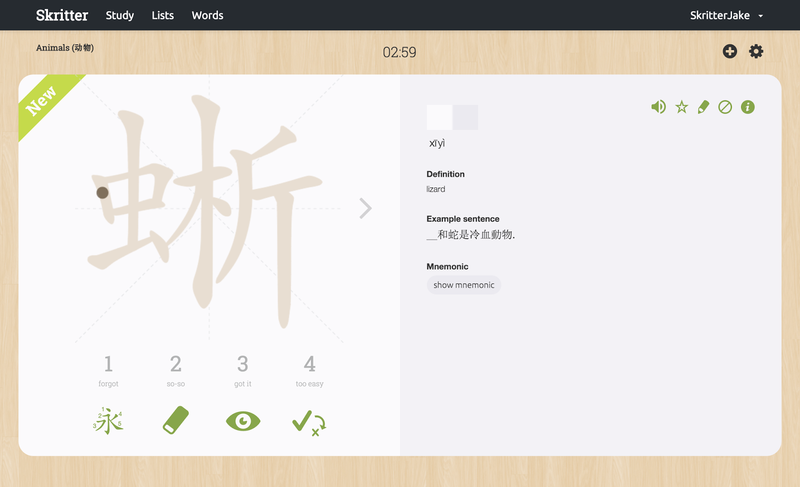 From now on, rather than being presented with a blank canvas, any new items that appear on Skritter provides a traceable character along with a full reveal of character reading, definition, example sentence and more. Rather than race through a new character, we hope this will force everyone to take a bit of extra time to study and reflect upon the new items in your list. Teaching mode doesn’t stop at new item behavior on the new site. We also want to help detect leeches (here a leech is defined as a character or characters that you’re continuously getting wrong during a study session) and put a stop to them for good. Moving forward, the teaching mode prompt style will appear for any writing prompt you’ve gotten consecutively wrong twice during a given study session. Again, it’s our way of reminding you that this prompt could use a bit more study time. Teaching mode is now live on the Skritter 2.0 beta site. Either log in from the link or click the “Study (Beta)” button from the main Skritter dashboard. We hope you enjoy the first step of Skritter becoming an even more powerful character teaching tool! If you have any comments about this new feature, please be sure to let us know in the comments below or join the Discourse thread here.